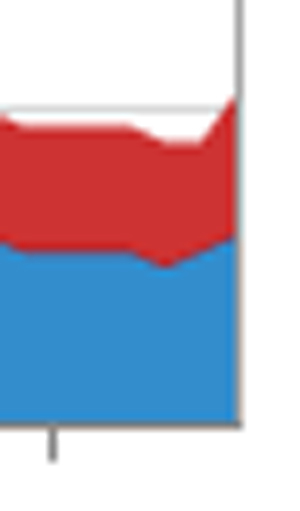 Baker Hughes reported that the U.S. rig count dropped by 11 this week to 1,763. Oil rigs were down 13 to 1,327, gas rigs were up two to 431 and miscellaneous rigs were unchanged at five. 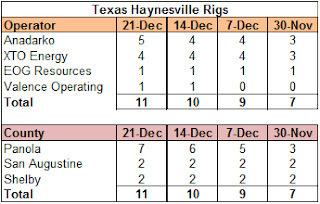 By type, horizontal rigs were up six to 1,111, vertical rigs were down ten to 477 and directional rigs were down seven to 175. Among gas rigs, horizontal rigs were up five to 309, directional rigs were down three to 66 and vertical rigs were unchanged at 56. Another week, another missed target for natural gas storage. The EIA reported that last week's storage level decreased by 72 Bcf to 3.652 Tcf. The weekly withdrawal was 17% below last year (-87 Bcf) and 49% below the five year average (-140 Bcf). The current storage level is now 2.3% above last year's record level (3.571 Tcf) and 12.8% above the five year average (3.239 Tcf). 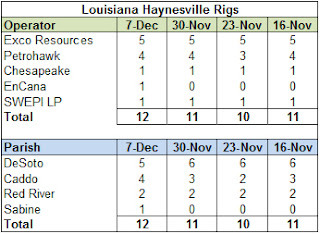 For the third straight week, the Haynesville Shale rig count was up last week. The count was up by two to 24 with one new rig in both Louisiana (13) and Texas (11). 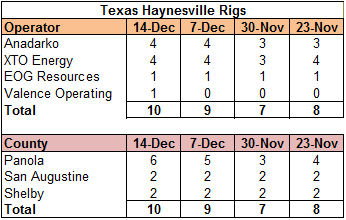 Over the past three weeks, the Haynesville count is up six rigs after bottoming out at 18 on November 30. The beginning of a recovery or "dead cat bounce?" The EPA has released new regulations on air pollution controls for soot and particulate matter and for industrial boilers and incinerators over the past week. Reactions by representatives on both side of the debate, specifically environmentalists and industry, are not entirely happy, which generally indicates that the new rules struck a successful balance between the two sides. The particulate matter regulation sets a new annual standard of 12 micrograms per cubic meter of air, down from 15, which was set in 1997. The new standard will be implemented by 2020 and will especially affect utilities burning coal. The rules on boiler emissions are the first of their kind and impose limits for mercury, acid gasses and fine particulate matter. The new rules will add costs for entities using older equipment with inadequate pollution controls, so expect to hear lots of complaining about "government overreach." But lest we forget, pollution is a human-generated problem, and by taking no action, we effectively subsidize companies to create a dangerous public health problem for which millions of people suffer. Anyone who knows an asthmatic or someone with lung disease understands the negative impacts of particulate pollution and should appreciate these actions. The Baker Hughes rig count showed a 25 rig decrease this week, bringing the number of working rigs in the U.S. to 1,774. Oil rigs were down 41 (!!!) to 1,340, gas rigs were up 13 to 429 and miscellaneous rigs were up three to five. By type, horizontal rigs were unchanged at 1,105, vertical rigs were down 17 to 487 and directional rigs were down eight to 182. Among gas rigs, horizontal rigs were up 15 to 304, directional rigs were down four to 69 and vertical rigs were up two to 56. As the much discussed Fiscal Cliff looms, Louisiana residents are constantly reminded by newspaper headlines of looming budget cuts to health care, mental health and education systems caused by our budget woes. These headlines make a recent report by the Pew Center on the States on unnecessarily costly tax incentive programs entitled "Avoiding Blank Checks" all the more poignant. 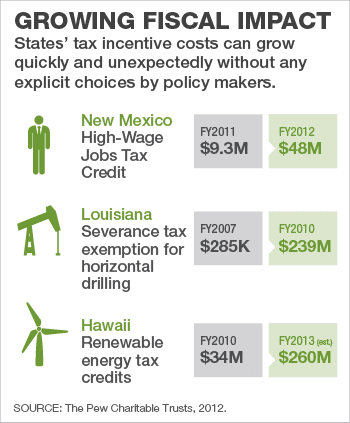 The Pew study highlights two Louisiana tax incentive programs, the Severance Tax Relief Program (STRP) for horizontal drilling and the Motion Picture Investor Tax Credit. Both programs are now used extensively, but they have become very costly for the state. For example, in FY 2009, the STRP cost Louisiana $239 million in lost revenue, up from $285,000 in FY 2007. The STRP was established in 1994, long before horizontal drilling and hydraulic fracturing came together to create the Haynesville Shale boom in 2008. The program, which is uncapped, exempts producers from paying severance taxes for a period of two years. Because shale wells decline so quickly, the vast majority of the potential severance taxes would have been paid in the first two years. The program likely won't be as costly to taxpayers in FY 2011 and 2012 because of the sharp decline in Haynesville drilling and completion activity, but the state has no business overlooking more than $100 million in annual potential revenue. The EIA working gas report showed a decrease of 82 Bcf to 3.724 Tcf. The weekly withdrawal was 18% below last year (-100 Bcf) and 43% below the five year average (-144 Bcf). The current storage level is 1.8% above last year (3.658 Tcf) and 10.2% above the five year average (3.379 Tcf). After getting so close to normal, storage levels are backsliding to dangerous levels. Temperatures last week averaged 42.6 degrees, 4.7 degrees warmer than last year and 4.4 degrees warmer than the five year average. 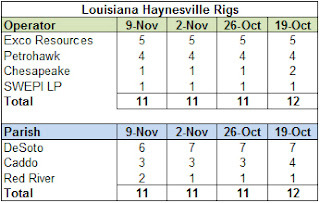 For the second straight week, the Haynesville Shale rig count was up, this time up one rig. Texas was up one to ten and Louisiana held at twelve. This week marks the return of J-W Operating to the Haynesville, as the company took over one of EXCO Resources' rigs. Valence Operating is also back in Texas drilling a vertical rig in Panola Co. Valence has been on-and-off with a rig over the past year several years. The Baker Hughes rig count dropped by one this week to 1,799. Oil rigs were down one to 1,381, gas rigs were down one to 416 and miscellaneous rigs were up one to two. By type, horizontal rigs were up two to 1,105, vertical rigs were down two to 504 and directional rigs were down one to 190. Among gas rigs, horizontal rigs were up four to 289, directional rigs were down one to 73 and vertical rigs were down four to 54. Things have really slowed down in the Haynesville Shale. 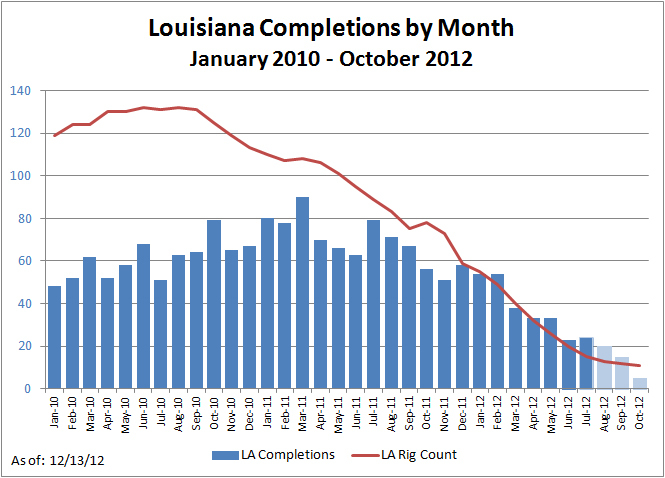 This week, there are no new Louisiana completions to report. 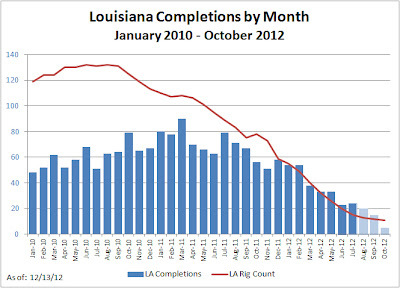 In the past several months, there were only 20 Louisiana completions in August, 2012 (actually completed, not reported), 15 in September and five so far in October. While we would expect to see completions continue to decline, the lack of reported completions speaks volumes about the lack of activity. 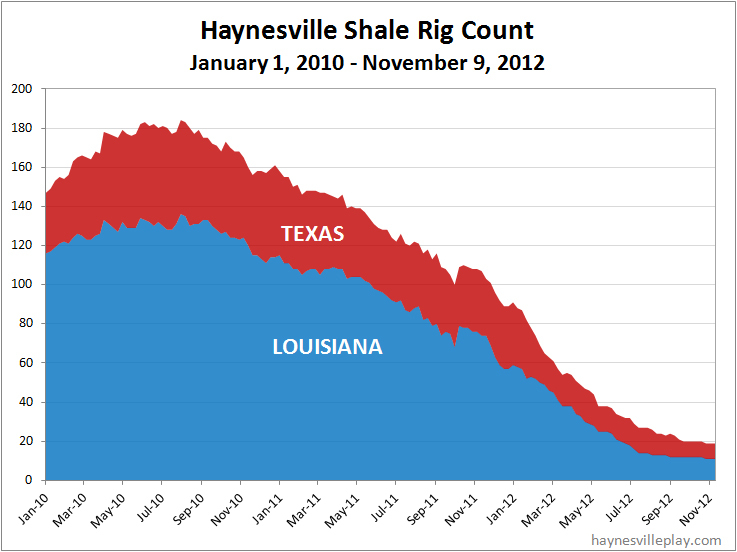 By comparison, in 2011, a down year for the Haynesville, there were 71 completions in August, 67 in September and 56 in October. As the chart below shows, declining completions certainly make sense with the declining rig count. There is still a backlog of uncompleted wells, but they don't seem to be going anywhere fast. This chart also shows that when gas prices do pick up, you will first see a wave of completions before you see a bunch of new rigs. Proving that we are never quite out of the woods, the EIA reported a 2 Bcf net injection to working gas in storage, bringing the working gas in storage to 3.806 Tcf. Quite a setback to the quest to regain normalcy, I'd say. The net injection was way out of whack with last year (-79 Bcf) and the five year average (-113 Bcf). The current storage level is 1.3% higher than the same time last year (3.758 Tcf) and 8.0% above the five year average (3.523 Tcf). By comparison, last week, the difference between the current level and the five year average was 4.6%. Temperatures last week averaged 49.3 degrees, which was 8.4 degrees warmer than last year and 9.3 degrees warmer than average. Exxon released its annual forward-looking 2013 energy outlook report today, and the report sees a stronger market for natural gas than was indicated last year. It's an interesting report that forecasts demographic and energy data through 2040, but I'll cherry pick some bits relevant to natural gas below. Overall, Exxon expects natural gas to overtake coal for the second largest energy source by 2040. Gas is expected to have a 65% growth rate compared to coal, which should decline slightly over the same period. Demographically, Exxon sees world population growing to 9 billion by 2040. By 2030, India should overtake China as the most populous country. By 2040, India will still have a relatively young population while China's age distribution will look very much like that of developed countries. 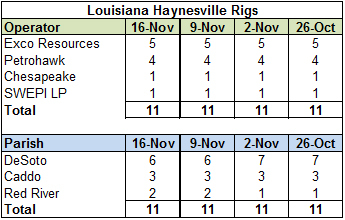 Yes, you read that right: the Haynesville Shale rig count was up three rigs last week to 21 working rigs. Texas was up two to nine and Louisiana was up one to twelve. <---Let's get a closer look. Small but pretty! It's amazing (and sad) what gets me excited these days. In Texas, both Anadarko and XTO Energy added a rig, while in Louisiana, Encana resurfaced with a new rig. As we discussed two weeks ago, Encana's reemergence is part of their big joint venture with Nucor to supply the steel company with gas. Word on the street is that this might be the only Encana rig working the Haynesville for a while, so we will temper our enthusiasm (but it's still nice to see them back). The Baker Hughes U.S. rig count showed an 11 rig decrease, bringing the number of working rigs to 1,800. Oil rigs were down four to 1,382, gas rigs were down seven to 417 and miscellaneous rigs were unchanged at one. By type, horizontal rigs were down seven to 1,103, vertical rigs were down two to 506 and directional rigs were down two to 191. Among gas rigs, horizontal rigs were down seven to 285, directional rigs were down one to 74 and vertical rigs were up one to 58. 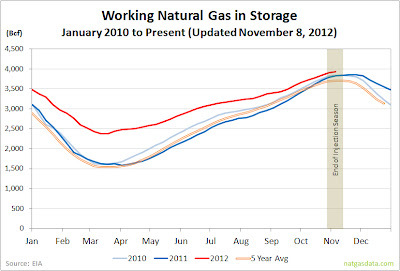 The EIA working gas in storage report showed a 73 Bcf net withdrawal, bringing the working gas in storage to 3.804 Tcf. The net withdrawal was significantly better than the same week last year (-14 Bcf) and 43% lower than the five year average (-51 Bcf). The current storage level is 0.9% below last year (3.837 Tcf) and 4.6% above the five year average (3.636 Tcf). 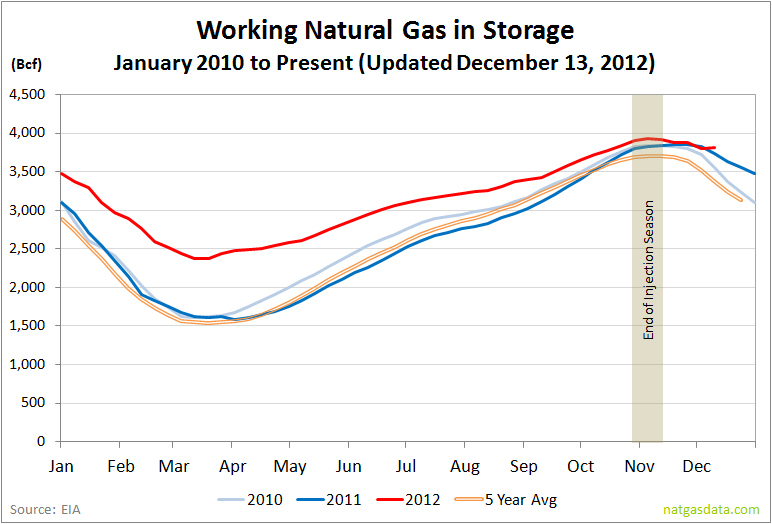 This week marks the first time since November 5, 2011 that the current year storage level has been lower than the previous year's. Temperatures last week averaged 41.7 degrees, 5.9 degrees cooler than last year and 0.4 degrees cooler than average. The U.S. Department of Energy's feasibility study on the impact of exporting natural gas has been completed and it shows that exporting natural gas would lead to "net economic benefits" and would be in the nation's best interest (another link). It is now up to the DOE to rule on the approximately 15 LNG export applications pending. The favorable study is not a guarantee of approval, but the DOE has stated that the results of the study would play into its permit decisions. The study, which was completed by NERA Economic Consulting and had been delayed a couple of times, hardly creates an open-and-shut case for LNG export. Critics will hammer away at the assumptions and conclusions, and the DOE is unlikely to take any action on approving new permits for at least a month while it absorbs the implications of the study and receives public comments. The DOE has indicated that all applications will be considered on a case-by-case basis, and it is unlikely that all of the applications will be approved. The winning argument showed that the net wealth transfer in exporting gas outweighed the slightly increased prices that manufacturers and home consumers would see. The study was an economic study and did not consider environmental concerns. There has been a great deal of lobbying on behalf of chemical producers and manufacturers who argue that the current "manufacturing renaissance" would be in danger if we begin exporting gas. In truth, not all of the 15+ applications will be approved, and export will mainly serve to strengthen the domestic gas production industry by diversifying the consumer base, thus helping to build a floor under gas prices. While manufacturers like the current low gas prices, what they really appreciate the certainty associated with a large, reliable supply. Commodity prices can be hedged as long as the supply remains robust, and the manufacturing concerns knew all along that natural gas prices at the current level aren't sustainable. 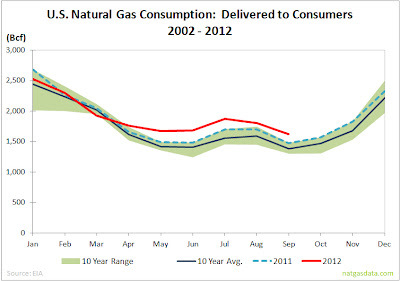 This is great news for natural gas. I have to say that I was really sweating this one out. While gas producers are going to lift a glass to celebrate this victory, the coal producers are probably pretty excited too. They would love to see a permanent floor under gas prices that is higher than the cost of coal. 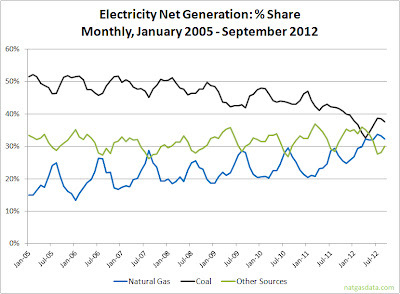 The EIA September report showing net generation of electricity by energy source shows both gas and coal dipping in market share. 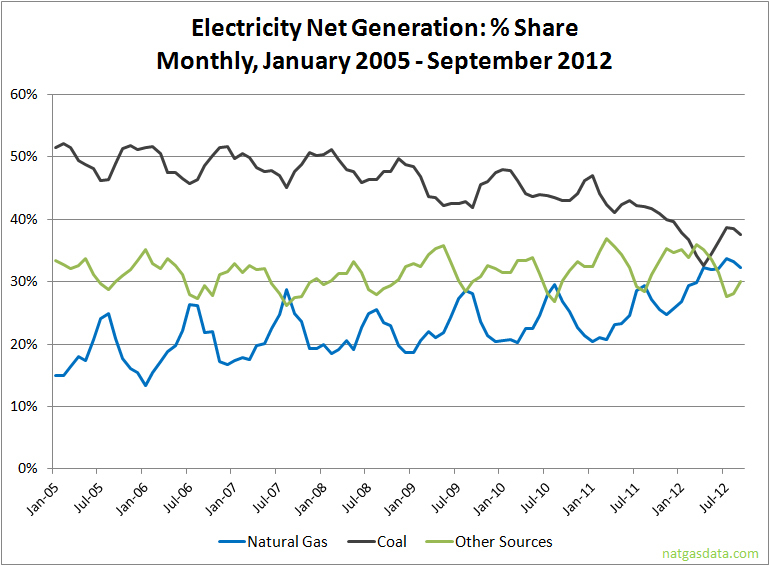 Gas decreased by one percentage point from the previous month to 32.3%, while coal dropped by the same margin to 37.6%. Other energy sources increased by 1.9% to 30.1%. 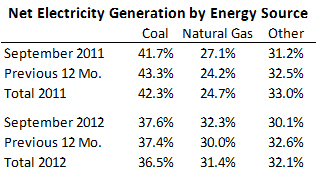 Year-to-date versus 2011, gas is up 6.7 percentage points to 31.4%, while coal is down 5.8 points to 36.5%. 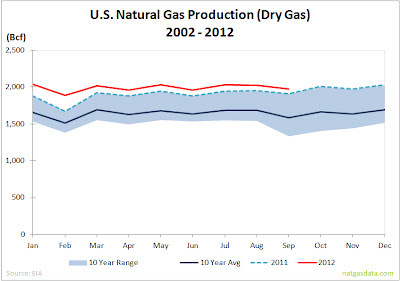 Last week, the EIA released its monthly natural gas production and consumption data through September 2012. Bottom line, production is higher than average, but so is consumption, thanks to increased usage by utilities. Net dry gas produced in the U.S. was 1.973 Tcf, which was 3.3% higher than last year and 24.3% higher than the ten year average for September. YTD production of 17.9 Tcf is 5.5% above last year and 21.5% above the ten year average. Consumption in September, as measured by gas delivered to consumers, was 1.621 Tcf, which was 9.8% higher than last year and 17.1% above the ten year average. YTD consumption of 17.17 Tcf was 4.1% above last year and 9.5% above the ten year average. Freeport McMoRan the New BHP Billiton? Today, Freeport McMoRan Copper and Gold (FCX) announced that it has agreed to purchase both Plains Exploration and Production (PXP) and McMoRan Exploration (MMR). While FCX and MMR have similar lineage and some crossover management, they are separate companies. Plains is a big player in the Haynesville Shale by virtue of its joint venture with Chesapeake Energy. While the team has scaled back its drilling activities this year, it is the biggest producer in the play. I'm not entirely sure of the benefits of the deal to FCX other than the belief that oil and gas is going to be a good business going forward. (It's also a bit of a save for MMR, which has been having trouble bringing on its marquee ultradeep Davy Jones well in the Gulf of Mexico.) I can't help but thinking that this deal puts FCX in the same ballpark as BHP Billiton, which combines energy with mining and related businesses. 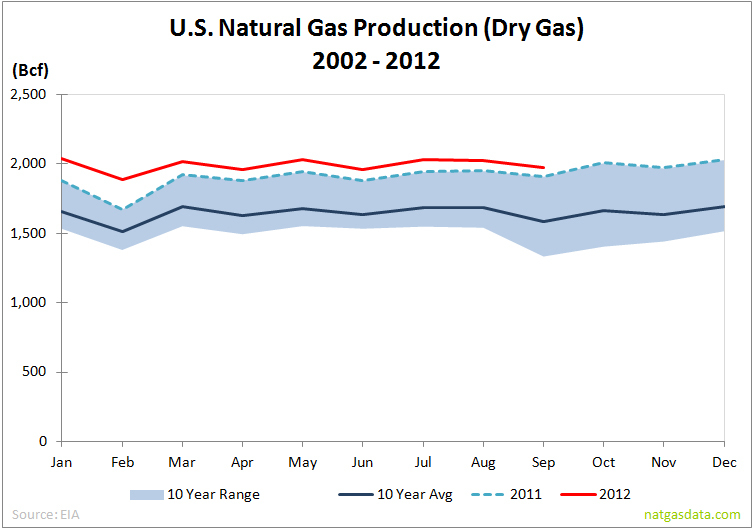 It looks like the NAT GAS Act will get a second chance this coming year. At the Natural Gas and Trucking Summit in Arlington, VA last week, U.S. Representatives Lee Terry (R-NE) and John Sullivan (R-OK) announced that they would reintroduce a version of the NAT GAS Act that was originally put forward by T. Boone Pickens aimed at increasing the adoption of natural gas as a fuel for trucks. While I support the concept of the bill, I don't expect a different outcome this time around (the House and Senate bills died in committee in 2011). Maybe I'm getting old or tired of the 24 hour news cycle, but news of the new NAT GAS bill makes me want to put on my devil's advocate hat for a few minutes. The argument favoring natural gas for trucks is an economic one first and environmental second. Natural gas is cheaper than diesel fuel and companies can hedge future prices of natural gas to help keep costs predictable. Natgas is also cleaner to burn - especially important in states where air quality is legislated - and easier on engines. On the negative side, natgas trucks cost more than diesel trucks and reduce some operational flexibility, especially for long-haul vehicles. But ultimately it's a business decision, and it looks like a win-win investment to me. So why do I have to pay for it? We now live in a climate of where corporations expect extra incentives (I won't say "handouts") to be coaxed to make certain decisions. A federal subsidy to convert existing vehicles to natgas or to purchase new ones would accelerate the payback period and make it a sweet deal. But why should we, the American citizens, have to grease the skids for companies to make a good business decision? Sasol, Ltd. announced yesterday that it will go forward with its proposed gas-to-liquids plant near its existing facilities in Lake Charles, LA (link to news release; link to project web site). Sasol will now commence engineering for the ethane cracker project, which is expected to cost between $16 and $21 billion and commence construction in 2014. It should be operational by 2017. The project, which will be one of the biggest construction industrial projects in the country, is a big win for the state of Louisiana. It will provide an economic boost during the construction and create hundreds of permanent jobs. Additionally, it will be a great customer for Haynesville Shale gas. From the time the feasibility study was announced last year, selecting this site seemed like a natural decision for Sasol, which has been a leader in GTL technology. With a large available site next to its existing facility in Westlake and close proximity to plentiful gas from the Haynesville Shale, the project seemed like a given. But that won't stop Gov. Jindal from placing it at the top of his 2016 presidential resume and taking a fundraising victory lap across the country. Godspeed Bobby, godspeed. The front page of Monday's Wall Street Journal features a great article on why it will take at least a decade to achieve the "shale boom" outside of North America. The bottom line is that the industry infrastructure, private land ownership and governmental support of private enterprise, among other factors, have held back the realization of shale oil and gas resources in Europe and Asia. Each country has its own issues, but the bottom line is that we are probably a decade from seeing any real development of shale oil and gas outside North America. This is good news for the U.S. for a number of reasons. First, cheap gas creates a competitive advantage for petrochemical and industrial producers that are expanding on our shores. Many of these companies now are coming home after chasing cheap gas in other nations. Second, the price differential between North America and what big consumers elsewhere in the world have to pay will support an LNG export market - assuming the federal government gets behind it - for at least a decade. While I am fond of shale gas, I'm rather pleased that the boom won't be as rapid elsewhere in the world. The golden goose has overproduced in North America and it will take a while to re-balance the ship. The total Haynesville Shale rig count was unchanged this week, but Texas saw the loss of a rig, while Louisiana saw an addition of one. A new rig? 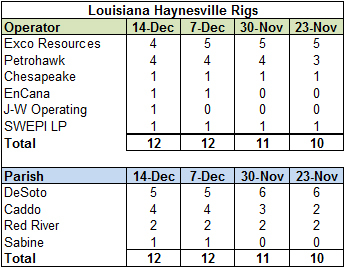 Before we get too excited, it was just a Petrohawk rig that fell of the list last week that reappeared this week. Petrohawk has maintained four rigs in the play since early August. In Texas there is one fewer XTO rig. The Baker Hughes rig count was down six rigs this week to 1,811. Oil rigs were down two to 1,386, gas rigs were down four to 424 and miscellaneous rigs were unchanged at one. By type, horizontal rigs were down four to 1,110, vertical rigs were down one to 508 and directional rigs were down one to 193. Among gas rigs, horizontal rigs were unchanged at 292, directional rigs were down two to 75 and vertical rigs were down two to 57. At a recent forum in Washington, D.C., Louisiana Sen. Mary Landrieu stated that she supports the export of natural gas from the U.S. This endorsement comes at a critical time for those wishing to export LNG, with the Department of Energy soon due to complete a market impact study that likely will determine if the nearly 20 applications pending for natural gas export will be eligible to receive approval to export gas to nations that don't have free trade agreements with the U.S. (i.e. the best potential customers). Sen. Landrieu's decision to support LNG is fraught with conflicts. Specifically, Louisiana is home to the Haynesville Shale and is the operational hub for most offshore drilling platforms, but it is also home to numerous chemical and manufacturing interests that thrive on cheap natural gas. Both produce lots of jobs (and potential wealth), so the pro-LNG decision is no simple matter. Yesterday, Massachusetts Institute of Technology (MIT) issued a new comprehensive study on the levels of "fugitive" methane escaping from shale gas wells that showed significantly lower actual emissions than previous studies had estimated (here is a link to the study). The new study was less theoretical and wider in scope and sample size than other previous studies. It also used actual field practices to determine realistic levels of methane leakage rather than relying on theoretical estimates. Quoting the MIT press release, "the amount of methane emissions caused by shale gas production has been largely exaggerated." In particular, the MIT study rebukes the earlier findings of Cornell professor (and shale gas critic) Robert Howarth, who riled the industry last year with a study saying that natural gas was less environmentally friendly than coal when looking at the life cycle of gas and including gas that escapes during the completion process. For many on the anti-drilling/fracking side, the concept of fugitive methane replaced the idea that water supplies can be threatened as the main line of protest against drilling. "In studying potential emissions, Howarth found 252 Mg of methane emissions per well in the Barnett site and 4,638 Mg per well in the Haynesville site. The MIT researchers, using their comprehensive well dataset, found that the potential emissions per well in the Barnett and Haynesville sites were in fact 273 Mg and 1,177 Mg, respectively. When accounting for actual gas handling field practices, these emissions estimates were reduced to about 35 Mg per well of methane from an average Barnett well and 151 Mg from an average Haynesville well." That's a significant difference worth restating: Howarth said 252 Mg of methane emitted from a Barnett well while MIT says 35 Mg (14% of Howarth's figure), and Howarth said 4,638 Mg from a Haynesville well while MIT says 151 Mg (3% of Howarth's figure). The debate will rage on, for sure, but this MIT study is a strong counterargument to the current talking points of those who oppose gas drilling and hopefully will receive the same level of press as the Cornell study. After two weeks of net storage withdrawals, this week's EIA working gas in storage report showed a 4 Bcf net increase in natural gas storage, bringing the current level to 3.877 Tcf. The weekly injection was in line with last year (+2 Bcf) but 22 Bcf above the five year average (-18 Bcf). The current storage level is now 0.7% above last year (3.851 Tcf) and 5.2% above the five year average (3.687 Tcf). Temperatures last week averaged 46.7 degrees, 3.6 degrees cooler than last year and 0.4 degrees cooler than the five year average. But, as the map below shows, the averages can be deceiving. Cooler temperatures were clustered on the coasts, while much of the country saw above normal temperatures. It looks like the sleeping Canadian giant may be reawakening in the Haynesville Shale, if only a little bit. Earlier this month, Encana signed a long-term deal to supply Nucor with natural gas to fuel its steel making plants, especially the new facility being constructed in Convent, LA. For the first time in ten months, Encana has filed for a new Haynesville permit in Sabine Parish (Terry Greer 16 H, serial #245693). Encana last had an active rig in the play in May 2012. It might be a little early to supply the Convent plant, but it is likely that any new gas supply for the facility will come from the Haynesville Shale. If - and I'm not saying this will happen - Encana does add a rig to drill this well, it would be the first time the Louisiana Haynesville rig count has increased since XTO Energy added a rig in January 27, 2012. But that increase was short lived as the company dropped all but one of its rigs six weeks later. 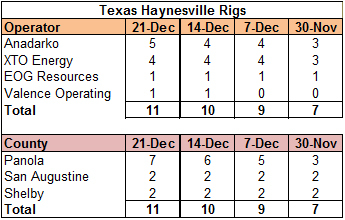 Man, it's hard to get even a small victory in the Haynesville these days! The Haynesville Shale rig count was down one this week to 18. Louisiana was down one to ten and Texas held at eight. The Baker Hughes rig count was up eight this week to 1,817. Oil rigs were down two to 1,388, gas rigs were up 11 to 428 and miscellaneous rigs were down one to one. By type, horizontal rigs were up nine to 1,114, vertical rigs were down one to 509 and directional rigs were unchanged at 194. Among gas rigs, horizontal rigs were up four to 292, directional rigs were up six to 77 and vertical rigs were up one to 59. I'm late reporting the weekly natural gas storage numbers because I spent the day in Bisbee, AZ. The main purpose of the trip was to tour the Copper Queen Mine, a copper mine dating back to 1887. The mine closed in 1975 after it was played out, but it struck me that the technology and working conditions underground didn't change much over the 90 or so years that the mine operated. Sure, there were better drills and a little more automation, but the life underground and the process to mine copper didn't really change over the life of the mine. It got me thinking about the people who are out there working in the "extraction field" today. Those of us who work "above ground" and are fans of the industry tout the job creation aspect of oil and gas, but we sometimes forget that it is a dangerous occupation. Just last week we were reminded of the inherent dangers after the explosion offshore at the Black Elk production platform. I don't have an earth-shattering observation to make other than the fact that we should all be thankful for those who risk their lives just to do their jobs, from oil/gas/mining workers to those serving in the military to those in law enforcement. They work hard and risk their lives, and we should not forget all that they do. Thanksgiving should be a very personal holiday. It can be a total drag (did I mention that I am in southern Arizona? ), but it should also be a time of personal reflection. Personally, I am thankful that I was born lucky. I was born to a great family in the best country in the world, a place where anyone can accomplish nearly anything. We bicker mightily about the right way to do things, but the framework that the founders of our nation created for our republic make it the most unique place on earth. We must not forget these gifts when we grouse about the details. The EIA reported a 38 Bcf net withdrawal from storage last week, bringing the level of working gas in storage to 3.873 Tcf. The weekly withdrawal compared favorably to benchmarks, being 47 Bcf lower than last year (+9 Bcf) and 41 Bcf lower than the five year average (+3 Bcf). The current storage level is 0.6% above last year (3.849 Tcf) and 4.5% above the five year average (3.705 Tcf). Temperatures last week averaged 48.0 degrees, 1.1 degrees cooler than last year and 1.6 degrees cooler than the five year average. 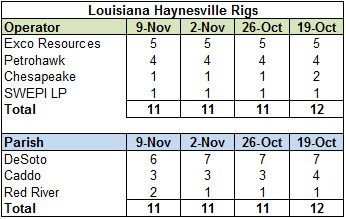 The Haynesville Shale rig count was unchanged this week, holding at 19. Louisiana was unchanged at 11 and Texas held at eight. The Baker Hughes rig count was up three rigs this week to 1,809. Oil rigs were up one to 1,390, gas rigs were up four to 417 and miscellaneous rigs were down two to two. 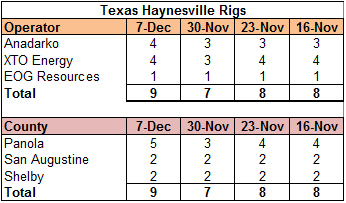 By type, horizontal rigs were up one to 1,105, vertical rigs were up two to 510 and directional rigs held at 194. Among gas rigs, horizontal rigs were up six to 288, directional rigs were up two to 71 and vertical rigs were down four to 58. Kinder Morgan yesterday announced today a 25-year transportation precedent agreement to provide approximately 200 MMcf/day to customers in Mexico through a new 60-mile 36" diameter pipeline that will run from existing mainlines near Tucson, AZ to Sasabe, AZ, which sits at the Mexican border. The pipeline would then interconnect with a new 500 mile cross-border pipeline being built by Sempra to Guaymas in the Sonora state. The gas would be used to fuel power plants that are being converted from fuel oil to natural gas. The proposed pipeline is the result of a request by the Mexican government to build transportation infrastructure to import U.S. natural gas. Mexico has its own natural gas reserves, including shale, but I guess it is cheaper, easier and faster to import U.S. gas. Interesting. The proposed Sasabe pipeline will require Federal Energy Regulatory Commission (FERC) approval and a presidential permit for the border crossing. Regulatory filings are expected in early 2013. If approved, construction would begin in Q1 2014 with the first gas flowing in September 2012. While 200 MMcf/day is not a massive new demand source, projects like this help diversify the "demand portfolio" for natural gas. It will be interesting to see if this approval gets caught up in the politics over the export of LNG since it requires a presidential permit. It might slip under the radar. Or not. The EIA storage report showed that working gas in storage has topped out for the year (hopefully!). By comparison, last year storage peaked the week of November 19. This week, working gas in storage was down 18 Bcf to 3.911 Tcf. This compares favorably to past years. The weekly injection was 38 Bcf lower than last year (+20 Bcf) and 35 Bcf below the five year average (+17 Bcf). The current storage level is 1.8% above last year (3.82 Tcf) and 5.6% above the five year average (3.685 Tcf). Temperatures last week averaged 48.0 degrees, which was 1.1 degrees cooler than last year and 1.6 degrees cooler than average. 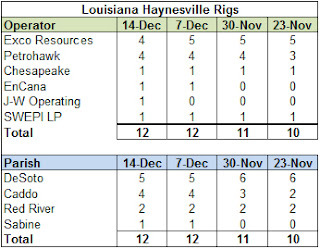 There has been a parlor game out there to predict when Haynesville Shale production will drop and by how much. It's counter-intuitive that production has remained rather steady when rig count has dropped nearly 90% from its peak in July 2010. One of the explanations for the lack of decline has been minimum quantities required by midstream deals struck by the various producers. Having nothing better to do this morning, I perused the September 2012 financial report for Petrohawk, which is now owned by BHP Billiton. I happened upon Petrohawk's minimum production commitments for the Haynesville Shale, at least vis-a-vis the gathering and midstream system it sold to Kinder Morgan last year. 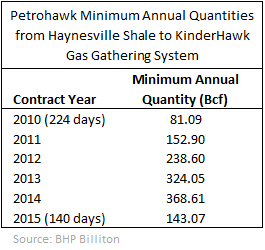 Back in May 2010 when Petrohawk formed KinderHawk Field Services, LLC with Kinder Morgan to monetize its gathering and midstream operations, Petrohawk made a commitment to use the gathering system for thirty years and made certain minimum commitments for the first five years (summarized on the chart below). In July 2011, Petrohawk sold its remaining 50% interest to Kinder Morgan but was required to maintain its minimum quantities or else "pay an annual true-up fee to KinderHawk." 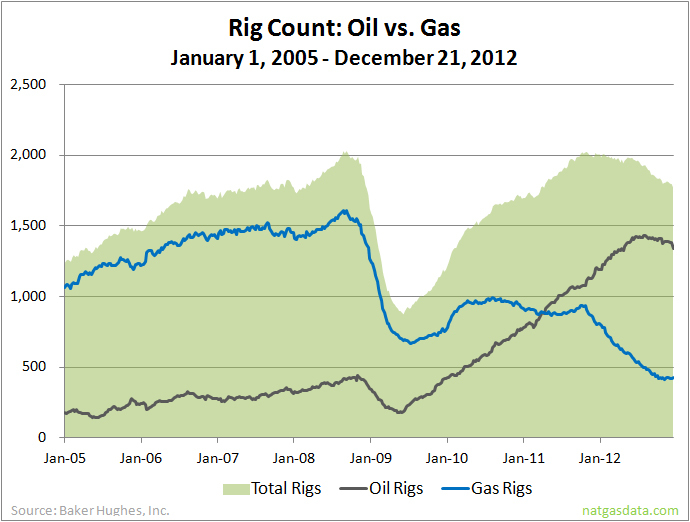 Petrohawk's rig count has dropped from highs in the mid-teens back in 2010, but it has been rather steady since spring. Early this year, the company actually added rigs (since removed) while everyone else was pulling them. Given the company's minimum production levels over the next couple of years, I would suggest that Petrohawk is one company that is not going away from the Haynesville Shale anytime soon. 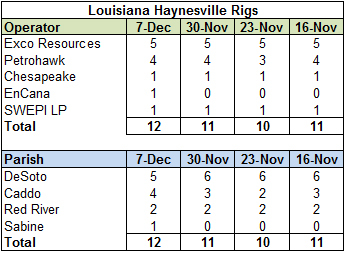 The Haynesville Shale rig count was unchanged this week, holding at 19. Louisiana (11) and Texas (8) were both unchanged. The Baker Hughes rig count was up six rigs this week to 1,806. Oil rigs were up 16 to 1,389, gas rigs were down 11 to 413 and miscellaneous rigs were up one to four. By type, horizontal rigs were down one to 1,104, vertical rigs were up eight to 508 and directional rigs were down one to 194. Among gas rigs, horizontal rigs were down one to 282, directional rigs were down three to 69 and vertical rigs were down seven to 62. What a terrible election season this was. I'm so relieved not to have to see smiley "surrogates" and pundits on the screen every time I turn on the TV that I might actually start watching cable news again. The silence is deafening, but in a good way (although the upcoming row about the "fiscal cliff" will certainly break the silence). While we all try to figure out the real winners and losers from the election, I'm pretty certain that we will be able to put natural gas pretty high in the winner's column. Even though the energy industry spent big bucks against President Obama (of approximately $116 million spent, 80% went to Repubs, 20% to Dems), his re-election bodes well for gas. Why? Obama's polices drive demand for natural gas. Note the new permit below from Marathon Oil. This is only their fourth Haynesville/Bossier permit and their first since early 2010. By my count, Marathon hasn't run a rig in the Haynesville play since April 2010 and does not seem particularly active in other formations in the region. Does this mean that they are bringing in a rig? The weekly EIA storage report showed a 21 Bcf net injection, bringing the total working gas in storage to 3.929 Tcf. The weekly injection was 56% below last year (+48 Bcf) and 42% below the five year average (+36 Bcf). The total storage level is now 2.9% above last year (3.82 Tcf) and 6.6% above the five year average (3.685 Tcf). Temperatures last week averaged 51.0 degrees, 1.3 degrees warmer than last year and 1.0 degrees cooler than the five year average.